Way back when all living things were just single celled organisms, a random mutation caused some cells to create a dark colored protein that could absorb a narrow range of photons. Those cells could now detect light: if the protein gained energy, there must be light. Based on the rotation of our planet, light shines down roughly half the time at a single location. 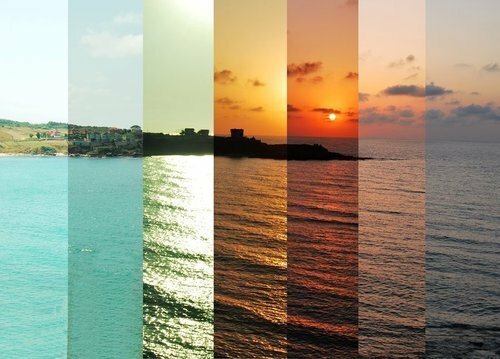 The cells that could tell the difference between light and dark could recognize night and day as well as up and down. Early Earth did not have a very thick atmosphere so plenty of ultraviolet light poured in from the sun every day. Ultraviolet light has a wavelength that is small enough to penetrate cells and energetic enough to cause mutations in genetic material. The cells that could recognize the presence of light swam downward into the dark ocean to avoid harmful rays. Those cells were able to survive longer in order to pass on their traits. By the time photosynthesis developed, cells that could detect the presence of light were better adapted to move and grow toward the light source. You can probably imagine the advantage sight gave to predators and prey. Over time, organisms randomly adapted different shapes as they diversified. One of the advantageous shapes was a divot with that dark protein at the bottom of it. A divot allowed organisms to focus light in order to see clearer images as well as shadows. Over generations, the divot deepened (those who had deeper divots were better adapted for survival) and the top of the divot closed in to leave just a small hole for light to enter. A vacuole filled with thick liquid condensed and was repurposed into a lens to better focus incoming light. Other adaptations like multiple eyes, external lenses, and muscles that could contract to widen the opening for light, gave organisms increasingly better awareness of their surroundings, improving their chances for survival. The adapted structures surrounding the pigment molecule gave the organism visual information, but we couldn’t see color until the adaptation of different communicator cells. Beyond our perception of light and dark, humans only possess three types of photoreceptors giving us the perception of red, green, and blue. All of the colors that you have ever seen are just different combinations of signals being sent from those three types of cells. Other organisms developed different numbers of photoreceptors: dogs have even fewer than us, this is why we say that dogs see in black and white. 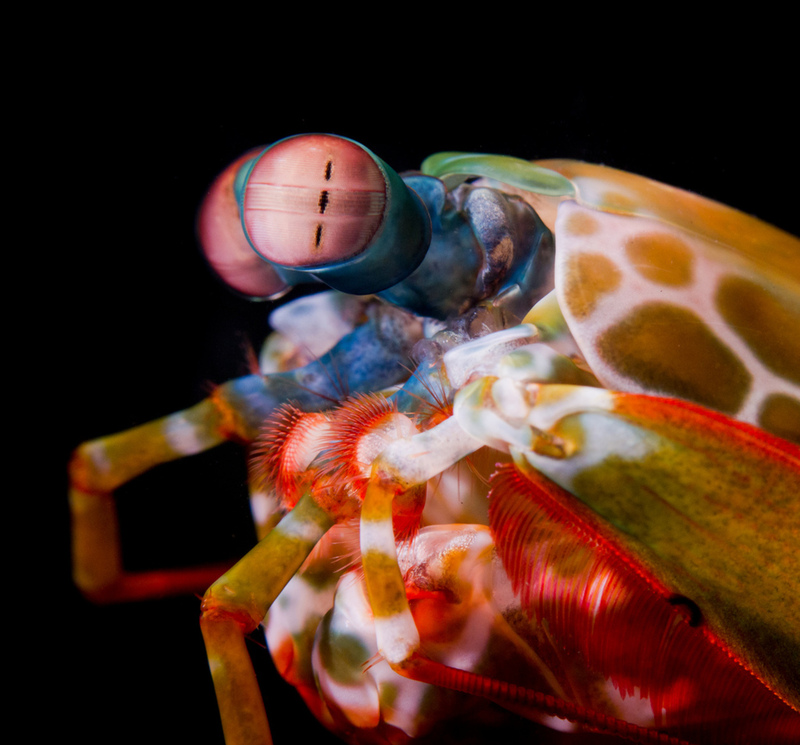 Another organism called a mantis shrimp has 9 different types of photoreceptors, meaning they have the ability to see colors that we cannot even imagine! You might be asking, “Why didn’t we develop more different colors?” The answer is resource allocation. To conserve as much energy as possible, the bare minimum was enough to get by. Three types of photoreceptors gave us plenty of information to interpret our world and more wouldn’t necessarily give a significant advantage. Dogs didn’t develop as much color perception because they allocated more resources toward smell receivers. If you know how something works, you can control it. Try an experiment with your sight. 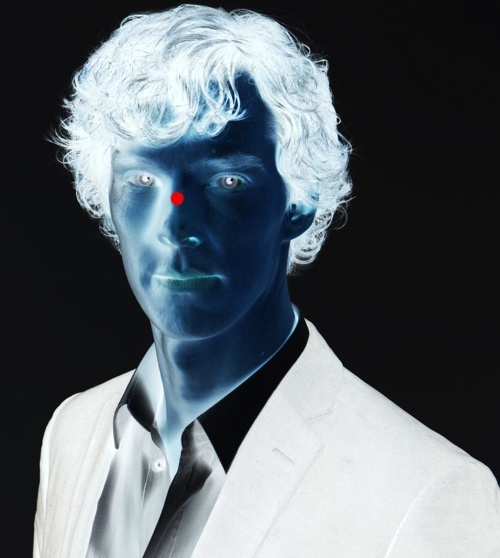 Take a look at the following inverted color picture and stare at it for at least 30 seconds. When you look away and relax your eyes, or just close them, you will see the image with the colors inverted back to normal. Colors have opposites because each of our photoreceptors signal one wavelength or another. We created a wheel to represent color because the opposite side represents complementary colors. When a single color has been absorbed over a long period, the photoreceptor will rebound and signal the opposite color when the stimulus is gone. 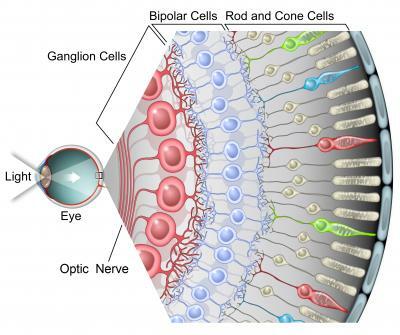 The visual signals sent from your photoreceptors stimulate the neurons of your brain which send signals to other neurons in order to process the visual information. Stimulation of the neurons releases pleasure to encourage us to keep doing that. This is the reason bugs fly toward the light and is also the reason why it’s so hard to stop staring at the television. You have adapted to be constantly aware of your surroundings. Your sight lets you identify the presence of light as well any changes in your environment. The television gives off a light source that is constantly changing. Constantly processing the new information releases pleasure, meaning the moving light source has a strong grip on your attention. We’ve been conditioned to recognize blue light as daylight and send signals to stay awake. More reddish light, like sunsets and campfires, signal nighttime and our bodies prepare for sleep. Our use of screens with constantly changing, blue-white light has created a culture of addicts. We’re addicted to staring at screens for the illuminated entertainment it provides. Our addiction is messing with our sleep cycle and causing loads of other problems. Learning how you see not only satisfies your curiosity, but it can also help you take care of the only body you have. Understanding your body on a more fundamental level gives you a greater appreciation for everything you might normally take for granted. Appreciate what you have, even if what you have is common.